This is the first World Series elimination game in Fenway Park since 1975. 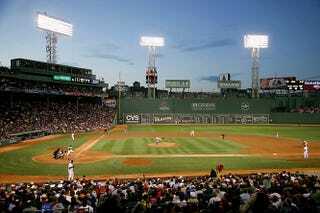 If the Sox win tonight or tomorrow, they will celebrate at Fenway for the first time since 1918. Since then, obviously much has changed in baseball history, so I'm not going to try to throw comparisons at you about it. Instead, let's just look at two very good baseball teams that have been playing some weird games. This is a pitching rematch of Game 2, in which Michael Wacha lived up to the hype and nearly shut down the Red Sox, while John Lackey took a tough loss as the Boston defense went wild. Since then, David Ortiz has continued eating planets, baffling lineup decisions have been made (Shane Robinson batting second? ), and even more shenanigans have ensued. Tonight, look for some more quality pitching from Wacha Wacha Flame, Papi seeing no good pitches to hit and swinging wildly anyway, and St. Louis manager Mike Matheny pulling out all the pinch-hitters and bullpen moves he can muster to try to force action tomorrow night. In the local spirit, the choice of beer tonight is going to be a Boston Beer Works special, their Red October. A big, full-bodied ale should go well with some powerful baseball, and hopefully the game will mirror the ale's subtle hop finish. That the name is very timely and there's a location right next to Fenway only drives me more toward Red October, and I will certainly be enjoying one of these when Lackey throws the first pitch at 8:07. On a night that promises some history one way or another, let's all hope for something interesting and, as always, enjoy the game.